I used to be the person who scowered through CVS circulars for the cheapest body wash but cheap doesn’t always mean it is good for you. I started to realize my skin wasn’t as soft and the scent of soaps I bought smelled like…well…soap! I also noticed that many of these cheap soaps had a bunch of weird ingredients and often wondered if these overly processed soaps were the reasoning behind my sporadic breakouts and rough skin. I realized I had to start being picky and stop being lazy and cheap when it came to my skin, especially since my skin is very sensitive. 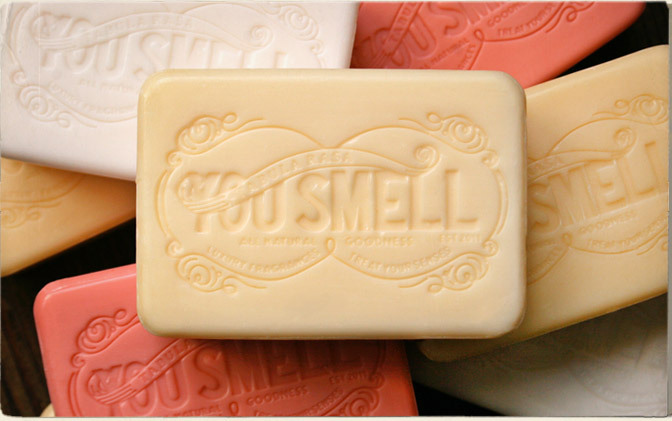 As of recent I discovered a brand called “You Smell” while browsing the net for great & natural bath products. I am not going to lie, it was the packaging that caught my eye first, but after reading up on it I decided I just have to try it! 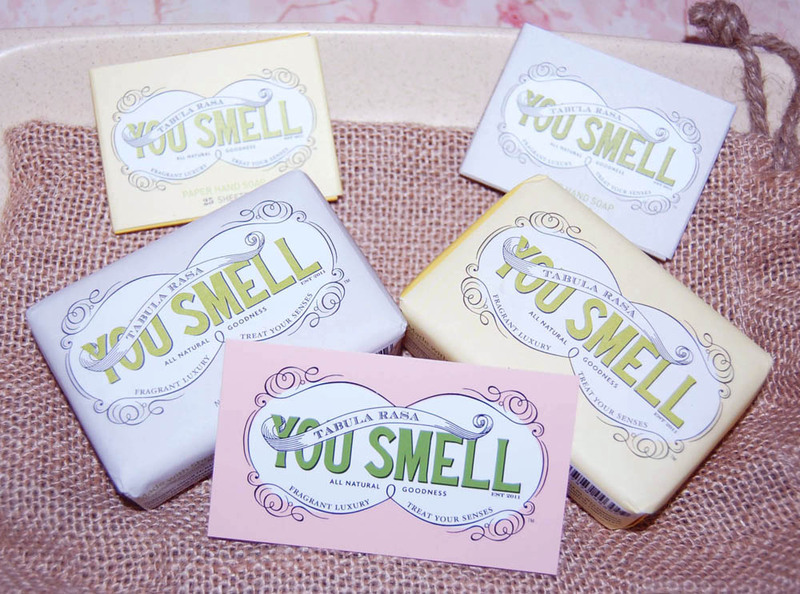 When I received the package I was immediately in love with the soaps already! The packaging was even prettier in person! 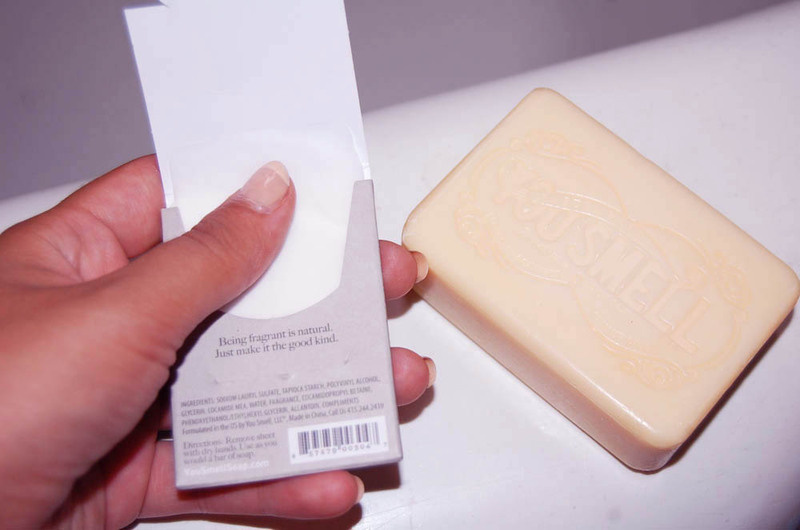 I have to say that after trying their lemon & divine scented bar soap, I was completely floored by how amazing my skin felt and the pleasant alluring scent it left behind. Now we all know fragrances are a hit or miss depending on the chemistry it has with our own natural scent and I can now say that I have found my match or should I say matches. I almost didn’t want to use them at all when I received them because the packaging alone made my bathroom look chic and pretty. After opening the bar soaps I was even impressed my the etching in the soaps, it looked luxurious and smelled delicious. Now that I am a fan, I use lemon for most days because it is very citrus-y and has a fresh herbal and spicy allure to it. I use divine for special days because it has a vanilla musk scent and anyone who knows me knows that I LOVE VANILLA anything. I have to contain myself from abusing the divine scent so I try to use it in moderation ;). It was also exciting to try the paper hand soaps YS offers. I think it is brilliant that they created hand soap made out of paper that dissolves in water. I mean, how many times do you go to a public restroom when you are out and about and all of a sudden you realize they are out of soap? I find myself using the paper soaps in divine and lemon even when restrooms I have been to already have soap. I just love the scents and the clean softness of my hands after I use it. Most restrooms use cheap soap that leave you feeling gross. I feel like I have been saved! I would never conduct a post on something I didn’t truly love and I had to share it with all of you pinup girls out there who are looking for bath and beauty products that leave you clean, fresh, soft, and beautiful. And like I said, it doesn’t hurt that the packaging is lovely too! Check out the You Smell site here. Thank you Megan for blessing me with your wonderful bath products! ← Last Betsey Johnson Sample sale! That’s hot! Thanks for the recommendation. I just saw these guys on the Shark Tank. The packaging is pretty awesome, and anything natural usually gets my vote! Hopefully I can find this in Canada to give it a try myself! I have been following them since their appearance on Shark Tank back in February as well. I was intrigued by the soaps, as well as their business. I will definitely purchase once it is in stores.